I recently made a baby gift for a friend and used the Jaden Baby Sneakers pattern. Textiles Used: Wool from a thrifted mens suit coat for the outside. I lined it with some black fleece from my stash. The Good: I love the way these turned out. So cute. And at $4 I thought that it was a steal and something I can make over and over. The Bad: The instructions were not the best. I was confused a number of times. Also, the shoes are more time consuming than they look. Conclusion: Very cute result. I would recommend it to anyone who feels confident with their sewing abilities. I think that beginners may find it hard to follow the instructions. How sweet, like little old men’s slippers. These are adorable, thanks for posting this idea! I have a few of these shoe patterns from the same company, and I’m embarrassed to say I’ve never made any, so I’m glad to read a review of them. When looking through the directions they did seem a bit confusing. I really need to try some. Wow – these are beyond adorable! 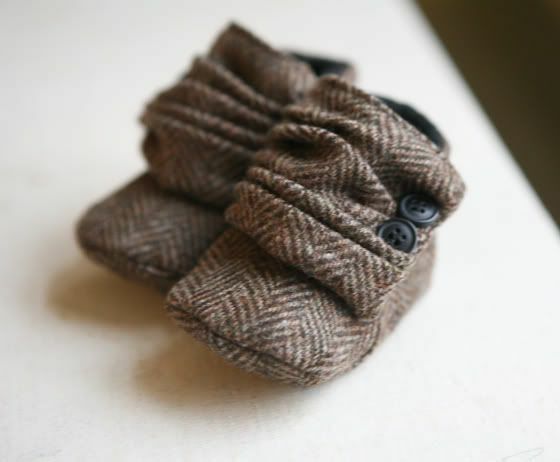 I’ve made a couple pairs of baby shoes too (though none this awesome! ), and I was also surprised how something so small could be so time-consuming! Would you consider selling these? Unfortunately not, but I am so flattered that you asked! I already gave them to my friend as a present. I think you should give them a go yourself though. Good luck.